In a world of content overload, executives at Entertainment & Media companies know they need to find new ways to engage, enlighten and inspire audiences through cutting-edge spaces that overlay digital information onto the physical world. 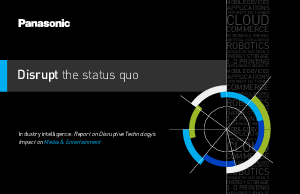 That’s what Panasonic, a leading innovator in 10 top disruptive technologies, found in its recent study. They asked senior technology decision makers across 13 industries how they are investing in new technologies, which they have already adopted and which they intend to implement. The report is available now to our readers. Get the report today for an inside look at how competitive companies are adopting disruptive technologies, innovating and planning for the future.